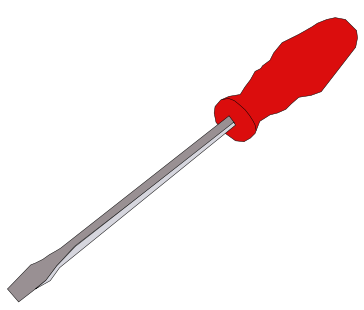 Screwdriver won’t go into the baked earth? Water! The Texas Forest Service answers the question “How do I know if my large trees need water?” Get a large screwdriver and try to put the blade 6″ into the ground. If it goes in easily, watering is not needed. If the ground is baked solid and you struggle to insert the blade, then those tree roots are calling out for water! 1. Run water from a hose and check every 30 minutes using the screwdriver; move the hose to several other locations under the drip line to thoroughly water. 2. Lay soaker hoses around the tree and run the water until the screwdriver check shows moisture several inches down. 3. Run a water sprinkler under the tree canopy until a tuna can or cat food can placed nearby has 1″ of water in it. If the screwdriver still won’t go into the ground easily, keep watering. This entry was posted in Education, Tree Care and tagged screwdriver, watering. Bookmark the permalink.